I’m not one to post glamorous photos of my most recent dinner on Instagram. While I enjoy cooking and consuming delicious and nutritious fare, I don’t often feel the need to share our meals with the world. But it’s important to listen to your audience. And my audience wants to hear about food. Loud and clear. I assume these concerned and perplexed askers visualize us suffering through miserable meals of cold canned green beans and slices of expired spam on stale bread, gnawing on dried moldy fish skin for a snack, probably while hurling about in perpetually stormy seas. That’s not what we eat. And it’s not usually stormy. There have certainly been (and still are) plenty of sailors who survive grueling passages on cold canned food, due to insufficient preparations and/or budgetary restrictions. We are incredibly fortunate – not only because we are able to live this crazy adventure – but that we can do so with a well-provisioned boat. Because food is a form of love. And it turns out it can also be a form of optimism, assurance, comfort and celebration. So we provision well. Before leaving, we overflowed two carts at Costco – twice – then squeezed it all into the storage space under the floorboards, to be kept chilled by the arctic waters. We stocked more than the necessaries. Nestled among the 50 cans of beans and 25 pounds of rice are family sized bags of sweet chewy dried mango, an eight-pound bin of M&M’s, delicate jars of fancy olives, huge boxes of cheez-its and a vat of Nutella. When the fish are running, we stock up – catching and cleaning, brining and smoking salmon until we’ve layered the bottom of the fridge. With some basic onboard ingredients, we take comfort in warm chocolate chip cookies, made to order calzones, homemade mac’n’cheese, and lots of brownies. When a beer-brewing kit made its way on board, we tried our hand at that, too. Great eating starts at generous provisioning, but it doesn’t end there. We are also over-provisioned with great cooks. Janna specializes in crepes, Dutch babies and heart-warming chili. Talia and Savai make delectable handmade pasta on boat-bound days, scattering flour and joy all over the galley. They also whip up encouraging bowls of soup with grilled cheese for us on long chilly watches. I often contribute fresh baked bread and the foundation for build your own pizza nights. John pulls together masterpieces with nearly no fresh ingredients left. And I have not met anyone who can cook up a fish with more skill than Graeme (or a bubbling pot of stew or Mediterranean couscous or most anything else, actually). We recently had a remarkable and memorable meal that inspired me to write about food. Stuck in Nome, waiting for the ice to shrink away from Barrow before sailing any further north, we quickly integrated into the home of Pat and Sue, a local couple that showered us with field trips, encouraging words, an open door, practical information, fast WiFi, and – literally – hot showers. On Tuesday, Graeme joined Pat and Sue on their annual river seining trip to collect salmon for the winter. On Wednesday, Pat took us to his cabin by the river where he hosts an extensive vegetable garden and gifted us buckets of kale, lettuce, potatoes and broccoli. And on Thursday, they invited us for dinner. The gathering was casual, and for no particular reason other than it was a lovely night for a potluck. Several of their friends were there, in addition to Sue’s father and sister-in-law, in town from Texas, and the six of us. The house was warm and relaxed, dotted with fox furs and whale bones, local art and vibrant conversation. 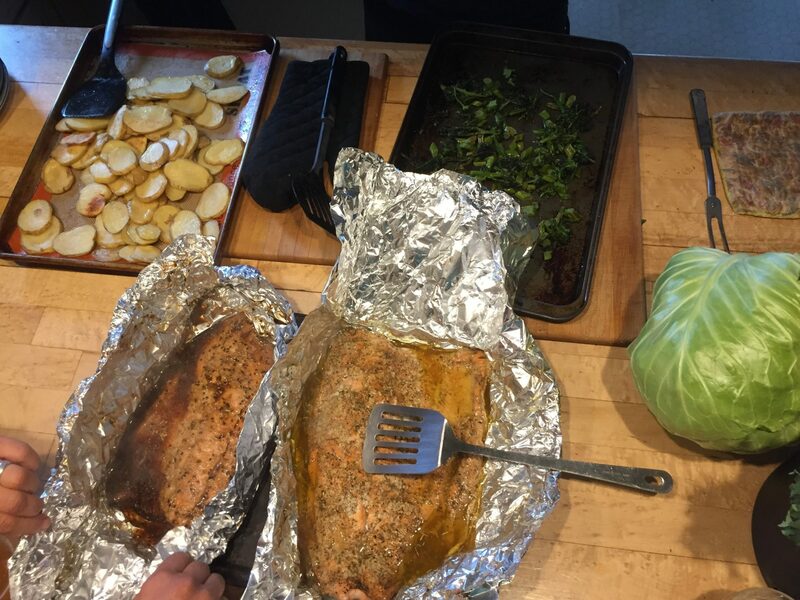 Spread across the table was an impressive feast featuring a huge Coho Salmon, freshly caught on their recent river trip, and stew made with the moose Pat brought home last hunting season. Accompanying these treats were Sue’s homemade biscuits (each one shaped like a heart, of course) with blueberry jam her daughter made from local berries, a bright salad and roasted potatoes from Pat’s garden, and a homemade blueberry-salmonberry pie, also made from berries Sue harvested locally. In fact, the only thing on the table that wasn’t local was the butter (not many cows in Nome, it turns out). Every bite was fresh and vibrant and delicious. Unfortunately, I was so impressed and excited to eat the delectable feast, I neglected to take a single photo of the evening. But it will forever be imprinted on my mind, aside all of Pat and Sue’s liberal hospitality and generosity. So if you happen to be pondering what we eat out here at the edge of the world, if you start to worry that we are forcing down goopy spoonfuls of cold spaghetti-o’s at every meal, imagine instead a warm house with a big view full of joyful friends enjoying meals made from scratch and made with love. They always taste better like that. Can I tempt you to read more?